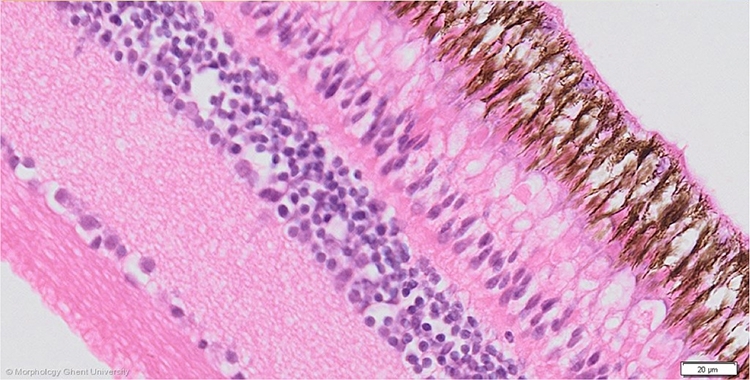 In contrast to mammals, birds and many reptiles possess three types of photoreceptor cells: rods, single cones and double cones, the latter playing a role in the detection of motion. Four to five different photo pigments are present in the cones, giving a bird excellent color vision. The cones not only are sensitive to red, blue or green but can also detect violet wavelength and in some birds even ultraviolet. The ability to see UV light has (up to now) been described in 35 diurnal bird species, 11 reptilian species, 2 amphibian species and 4 rodent species. In addition and characteristic for birds and reptiles, the cones contains an oil droplet with five possible absorbency spectra, each type filtering out all but one particular wavelength.